The Claire T. Carney Library has a new(ish) librarian! 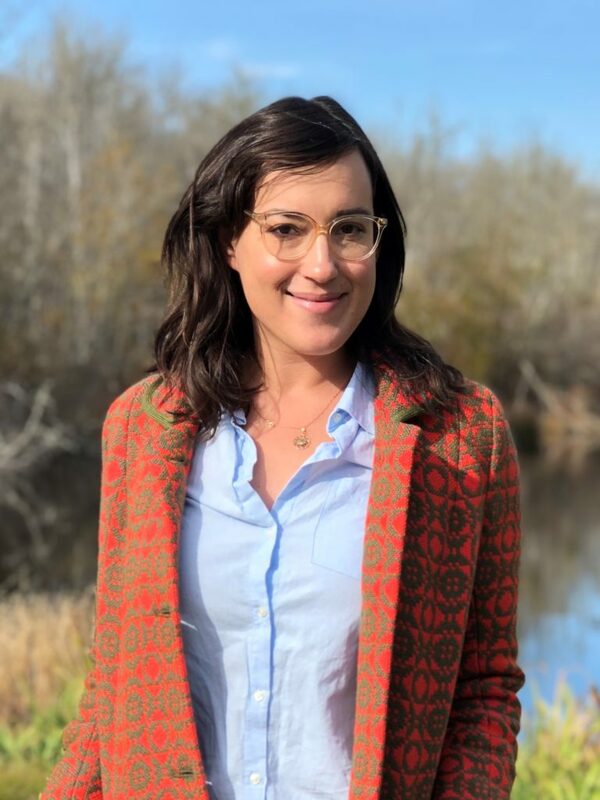 Read the interview below to get to know our new Social Sciences & Data Services Librarian, Rachel Baum. So you’re the Social Sciences & Data Services Librarian? What does that even mean? The “Social Sciences” portion means that I am the library representative (or “liaison”) to the Social Sciences department. I work with faculty to buy books, teach library instruction sessions to their classes, and advocate for them in library meetings. The “Data Services” part has to do with helping researchers on campus, whether students or faculty, develop and adhere to data management plans throughout their research process, then ensuring that the data they gather remains accessible and discoverable to other researchers. Originally, I am from Long Island, New York. Fun fact, New Yorkers hardly ever say “I’m from New York” without being more specific because otherwise, the follow-up question is “New York City?” and disappointing people with a “no” reply is a bummer. Where did you go to school and what did you major in? I did my undergraduate work at McGill University in Montreal, Canada. I majored in English Literature, focusing on Shakespeare, and minored in European History. I have both U.S. and Canadian citizenship, so getting to live in Montreal, where my dad grew up, was a wonderful experience. My master’s degree in Library and Information Science is from Simmons University, where I focused on academic librarianship, especially reference and instruction. Do you have any hobbies that aren’t librarianish? I’m not sure where this falls on the librarianish spectrum, but my favorite thing to do in my spare time is go out birdwatching. I know plenty of non-librarians who love it, but it also involves identifying and categorizing things, so it may count! I also love to cook and am trying to teach myself how to bake bread. What are you looking forward to this spring semester? I will be working with 10 different English 102 classes, and I’m excited to meet so many new students and help to start developing their academic research skills. Since I’m still relatively new, we’ll be doing a lot of learning together, which is my favorite kind of learning. If you had to give one piece of advice to students, what would it be? Don’t be afraid to ask for help! My job is to help you do your best work and feel comfortable researching, and I love it. How can someone contact you if they need help with research? You can email, call, or even stop by my office. You can see all of my contact information online. This entry was posted in General Library on January 24, 2019 by msylvain. 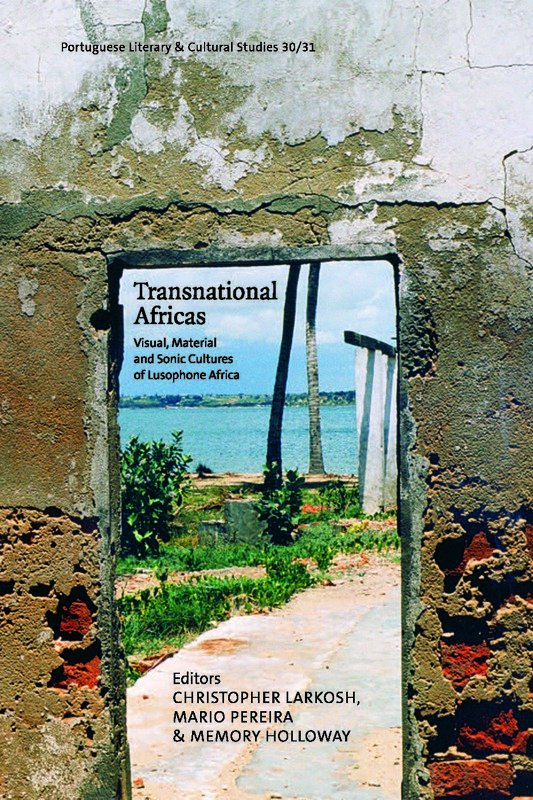 We are pleased to announce that Portuguese Literary & Cultural Studies (PLCS) 30/31, Transnational Africas: Visual, Material and Sonic Cultures of Lusophone Africa, is now available. You can find this issue as well as all back issues available for free on the journal’s website! Portuguese Literary & Cultural Studies (PLCS) is an interdisciplinary, peer-reviewed hybrid online and print journal that publishes original research related to the literatures and cultures of the diverse communities of the Portuguese-speaking world from a broad range of academic, critical and theoretical approaches. 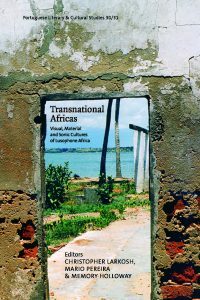 PLCS is published semi-annually by Tagus Press in the Center for Portuguese Studies and Culture at the University of Massachusetts Dartmouth. The Center for Portuguese Studies and Cultures ‘s Tagus Press publishes its electronic version of Portuguese Literary & Cultural Studies (PLCS) on the library’s journal hosting platform. This entry was posted in General Library, Library Publishing, Library Services on June 6, 2018 by msylvain. Share a Picture of You Studying in the Library! This entry was posted in General Library, Library Photos, Library Services on May 2, 2018 by msylvain. 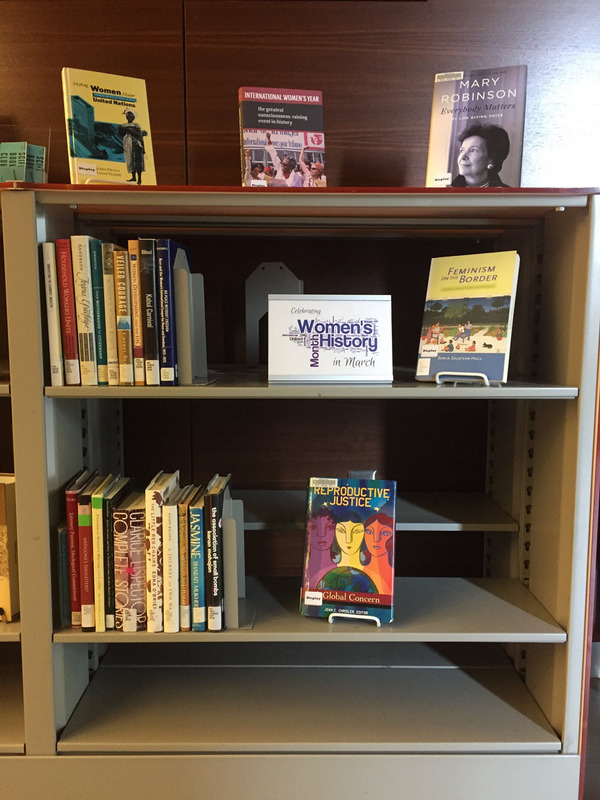 In celebration of International Women’s Day, Claire T. Carney Library honors women around the world with a book exhibit portraying women’s global voices and visions of gender equality. These titles are on display near the Circulation Desk on the 1st floor and are available to be borrowed. This entry was posted in General Library, Library Resources & Services on March 12, 2018 by msylvain. The Science Fiction Book Club’s pick for March is Lovecraft Country by Matt Ruff. Set in the Jim Crow era, this road trip takes Atticus Turner from Chicago to New England and back again. Blending historical fiction with supernatural horror in a local setting, this title will provide a riveting discussion. You don’t have to read any of the works by H.P. Lovecraft (native of Providence) to enjoy Lovecraft Country, but it’s hard to ignore the influences of his work on the book on many different levels. Not gaining popularity until after his death, Lovecraft’s work now defines a genre of “weird” horror which is undoubtedly present (not just by name) in Lovecraft Country. As its being discovered more explicitly through his personal letters, Lovecraft was “a virulent racist” and race plays a huge role in the book as well. 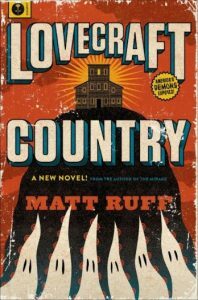 Lovecraft Country has caught the attention of HBO and its being produced by a slew of big name folks like (recent Oscar winner) Jordan Peele and J.J. Abrams. Read it with us now so you can be ahead of the popularity curve! You can find Lovecraft Country at your public library or by requesting it through interlibrary loan. We look forward to discussing Lovecraft Country with you in LIB 314 at 12:30pm on Thursday, March 22nd. This entry was posted in General Library, Library Services on March 6, 2018 by msylvain. 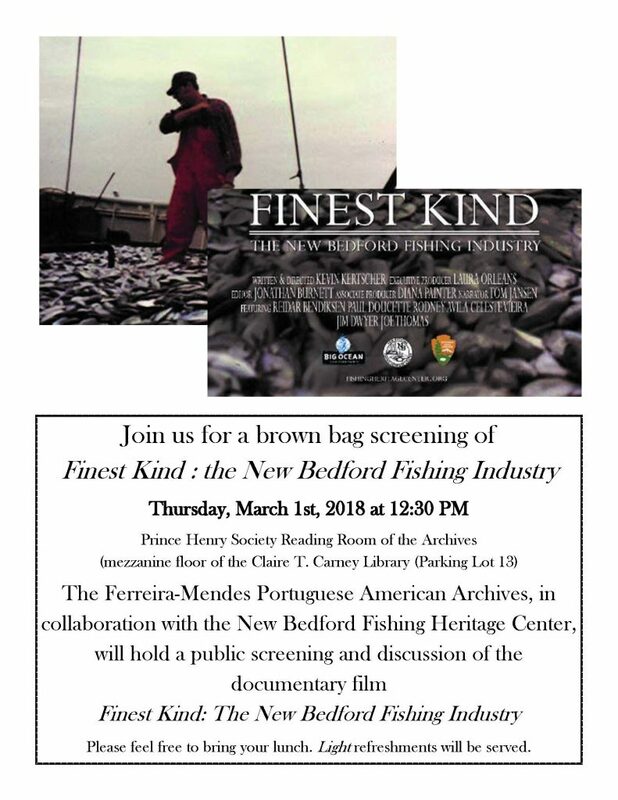 The Ferreira-Mendes Portuguese American Archives, in collaboration with the New Bedford Fishing Heritage Center, will hold a public screening and discussion of the documentary film Finest Kind: The New Bedford Fishing Industry. This entry was posted in Archives & Special Collections, Ferreira-Mendes Portuguese-American Archives on February 27, 2018 by msylvain. Welcome back for the spring semester! We hope you had a great break. So now that you’re back we thought we’d remind you about a few things. The library is back to regular hours. We are open from 7:30 am to 1 am Monday through Thursday, 7:30 am to 9 pm on Fridays, 9 am to 9 pm on Saturdays, and noon to 1 am on Sundays. 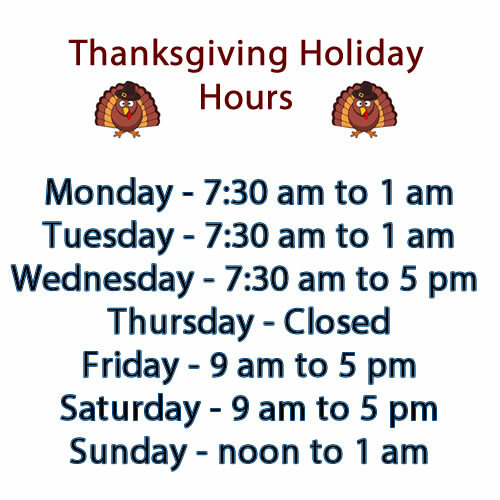 You can find holiday hours and other exceptions on our online calendar. 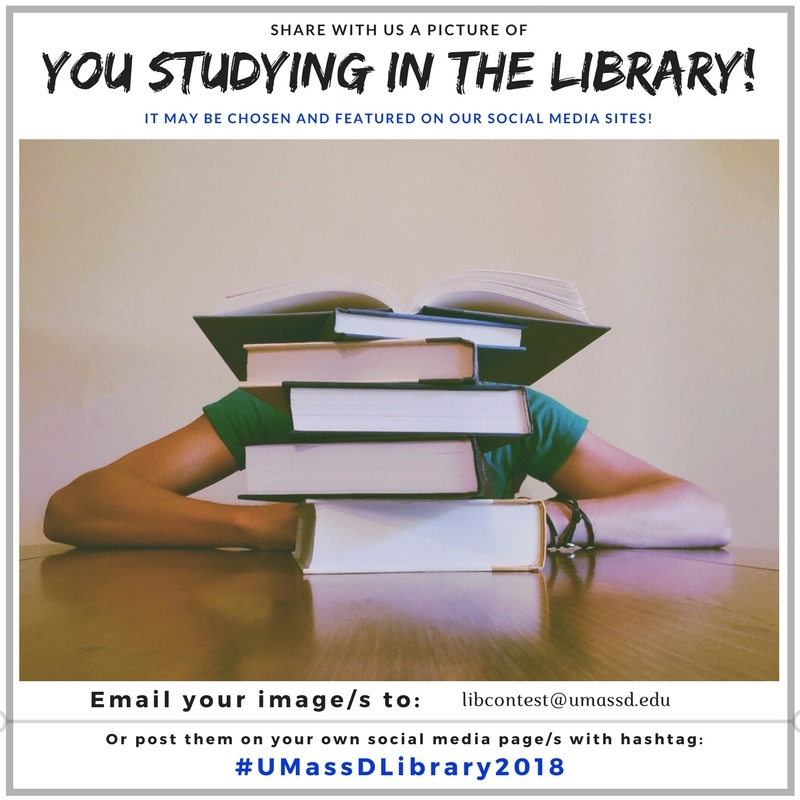 Remember to bring your UMass Pass when visiting the library after 10 pm as you must swipe your card to enter the building. We’re here to support your learning and research. If you have research questions, we have subject librarians who are happy to talk with you and help! You can email, chat, text, call, or stop by in person to connect with one of our librarians. Reference librarians staff one of the computers at the 1st floor Learning Commons Desk. They love to work with students, so please don’t be shy! Our Learning Commons student assistants also provide basic technical support with things like COIN at the same desk. So it’s a one stop shop for your technical and research questions. Are you someone who creates digital media projects? If so, be sure to check out our Digital Media Center (DMC) on the 2nd floor. 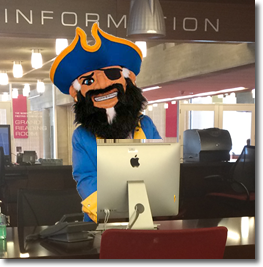 The DMC has unique software and provides specialized assistance to students. There are even creation rooms that are only available to students working on digital media projects and that can be reserved online. There are lots of study spaces throughout the library for individual and group study. Do you do a lot of group work? If so, you can go online and reserve a group study room! You will also see “table tents” on the 3rd and 5th floors to help you share the group study tables and help us all make the best use of the library’s study space. Or perhaps if you just wish to just notify a friend about where you’re going to be studying in the library; Then send them a link with a pointer on a library floor map of where you’ll be studying using the Find Me Here tool. And near the Learning Commons on the first floor there is a large quiet study space in the South Reading Room. Need a laptop for your work in the library? Check one out at the first floor Circulation Desk. If you’re back and already thinking about your senior project, your master’s thesis or the big paper you’ll have to write this semester, you might want to look up one of our expert subject librarians to help you with your research. You probably know about the library’s collection of online journal databases and books, but did you also know that the library provides access to thousands of online films? Our largest collection is through Kanopy. And if you ever need an item that the library doesn’t provide access to, you can request it free of charge through our interlibrary loan service. And if that’s not enough, for future stress relievers, we are sponsoring a Game Night every Thursday of the month in the Library Living Room with a variety of board games on hand. The library will also co-sponsor a De-Stress Day once a month in the Library Living Room with games, chair massage, and arts and crafts. Just miss reading for fun? We have a Science Fiction Book Club that meets once a month. Anyway, we hope you get the point. We’re glad you’re back and we hope that you’ll stop by at one of our service points and ask if there is some way we can be of help … or if you want, just to say Hi! This entry was posted in General Library, Library Services on January 24, 2018 by msylvain. 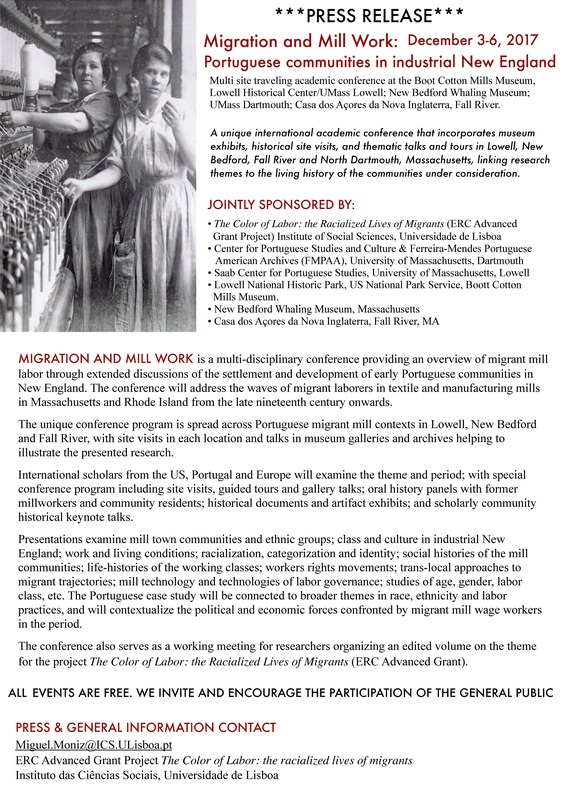 On Tuesday, December 5th from 2:30 to 5:30 pm the Ferreira-Mendes Portuguese American Archive will host three presentations as part of the Migration and Mill Work traveling academic conference. The presentations are free and open to the public. You’ll find the press release for the full conference at the bottom of this post. Using a variety of items—photographs, postcards, textual documents, oral histories— the exhibit will explore what it was like to live in the South Coast of Massachusetts during the 1920s. A time that saw both a burgeoning cultural scene but also a changing working environment for the Portuguese-American community that lived in this region. The author of the Strike of ’28, a local labor leader, who collected many oral histories of Portuguese millworkers held in the Ferreira-Mendes Portuguese American Archives will discuss his work, local Portuguese American labor history, and the wealth of research material in the FMPAA archives. Although he used state-of-the-art social science research methods (including extensive statistical analysis) to address social problems like infant mortality in migrant cities, Donald Tafts’s 1923 Two Portuguese communities did not fully depart from the old racialist paradigm with some of the work stirring indignation among New England’s Portuguese. This presentation will discuss the political and intellectual context of the book’s contents and reactions to it. This entry was posted in Archives & Special Collections, General Library, Library Staff News on November 30, 2017 by msylvain. 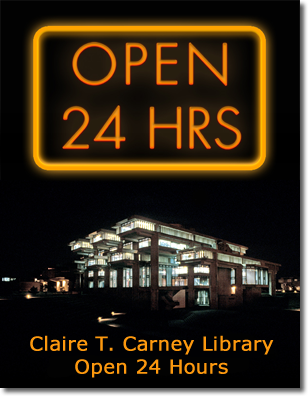 The Claire T. Carney Library will open its doors to the UMassD community for 24/7 hours starting at noon on December 3rd (Sunday) until December 18th (Monday) when we will close at 10PM. Library services for Circulation/Reserves, the Digital Media Center, and Reference will not have extended hours, so make sure to visit those service points during regular hours. You will also need a UMass Pass to enter the building after 10PM and until regular opening hours the next day. 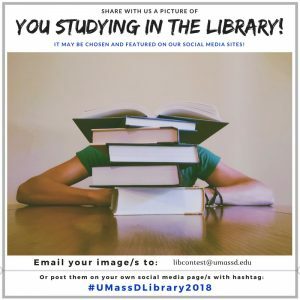 We hope you will find a variety of study spaces to choose from including our quiet study areas in the South Reading Room and Grand Reading Room (when no events are scheduled), several group study rooms available by reservation, and many individual and group study areas throughout the building. Please be mindful that we will be close to seating capacity, so if you are at a group table and not expecting team members, please use our Open/Taken table tents to offer seats to others. We also encourage everyone to be respectful of the space and other students by watching noise levels and picking up after yourselves should you bring any food/drink. If you have any question, please contact our staff either at the Circulation/Reserve desk (x8750), the Learning Commons desk (x8884), or the overnight security staff. We wish you all the best with your exams and a productive end to the semester! This entry was posted in General Library, Library Services on November 29, 2017 by msylvain. This entry was posted in General Library on November 20, 2017 by msylvain.